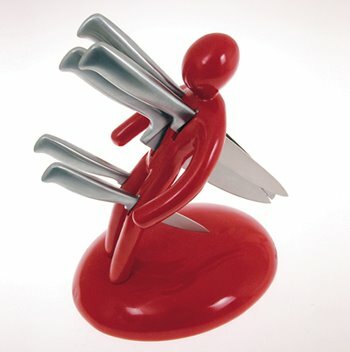 Well, isn't this the best knife block you've ever seen in your life? Forget bland polished beech, this is award winning stuff. Designed by the Italian design guru Raffaele Iannello, the 'Voodoo' - or as we like to call it the 'All Men Are Bastards' knife block, is destined to find its place among the greats in the top design museums of the world. 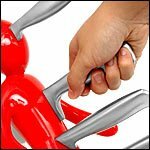 It comes complete with a set of 5 stainless steel knives: a paring knife; bread knife; carving knife and a large and small chopping knife. 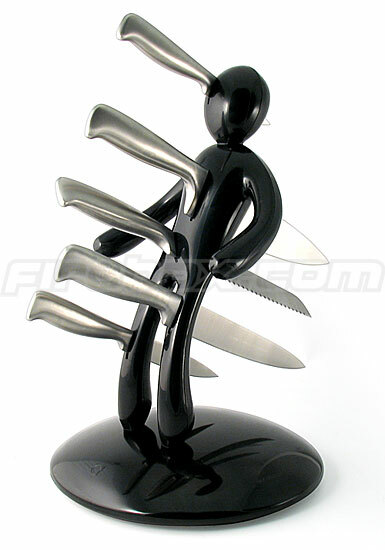 Each of the five knives is held in place by a small magnet in the body, and the blades are protected at the rear by a frosted plastic sleeve. Brilliant design, superb humour, what more could you want in your kitchen (and wouldn't it make the ultimate present for any number of occasions). If you want one of these just post a comment with your email adress, and I'll give you more details. Doesn't that defeat the purpose of keeping the blades within the block?